BenQ put its nReader on display at Taiwan's IT Month exhibition in Taipei and representatives say it will roll out in Taiwan and China this January for NT$8,990 (US$280). The e-reader sports a 6-inch touchscreen and plays music in addition to displaying e-books. The device is thin and light with digital ink quality similar to that of Amazon's Kindle. Users can download e-books and music wirelessly via 3G mobile technology and Wi-Fi. The new e-reader is just one of dozens of new Kindle-like products set to launch over the next few months from Taiwanese and Chinese companies. A subsidiary of Foxconn Electronics, Netronix, will start selling e-readers in China via mobile phone giant China Mobile, while Delta Electronics is working on e-readers and e-paper. Analysts expect Asustek Computer and Micro-Star International soon to reveal dual-screen netbooks, with an LCD screen and an e-reader screen in one. 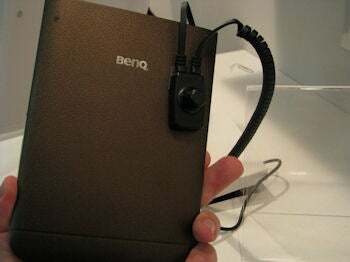 BenQ's nReader is made by a subsidiary of LCD screen giant AU Optronics, SiPix Imaging. The company's digital ink technology competes with that of E-ink Corporation of the U.S., which has agreed to be purchased by Taiwan's Prime View International, the manufacturer of Kindle. 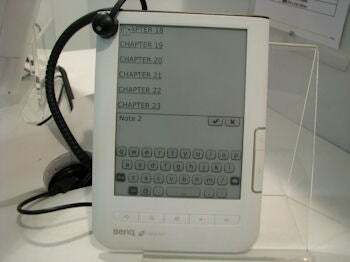 An e-book store will launch at the same time as BenQ's nReader with thousands of books, magazines, newspapers and other content on offer, a BenQ representative said. The nReader will be able to hold around 4,000 books in its 2GB of flash memory. Users can add capacity through a MicroSD expansion slot to enable the nReader to store over 10,000 books. Unlike some e-readers now with color displays, BenQ's nReader comes in standard black, white and gray, with 800x600 resolution. E-readers differ from LCD computer screens because they lack backlights that can tire a user's eyes. Digital ink is meant to be read in natural light. The device will be offered in Chinese, English and Japanese initially, and supports a number of e-book formats, including EPUB as well as MP3 audio. The device has an audio jack to plug in headphones. Another Taiwanese e-reader maker, Greenbook, also showed off its e-reader at the IT Month show. The device costs NT$8,950, has a 6-inch screen with 800x600 resolution, and uses E-ink digital ink technology. It carries 512MB of flash memory for storage but includes an SD card slot for a maximum 4GB of storage.